Nicholas Fox Weber, for thirty-three years head of the Albers Foundation, spent many years with Anni and Josef Albers, the only husband-and-wife artistic pair at the Bauhaus (she was a textile artist; he a professor and an artist, in glass, metal, wood, and photography). 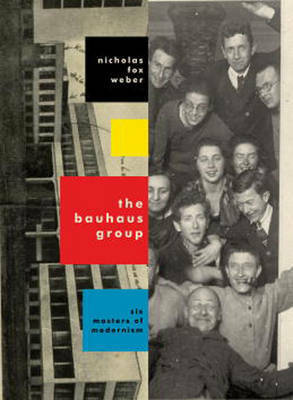 The Alberses told him their own stories and described life at the Bauhaus with their fellow artists and teachers, Walter Gropius, Paul Klee, Wassily Kandinsky, Ludwig Mies van der Rohe, as well these figures lesser-known wives and girlfriends. In this extraordinary group biography, Weber brilliantly brings to life the Bauhaus geniuses and the community of the pioneering art school in Germany s Weimar and Dessau in the 1920s and early 1930s. Here are: Walter Gropius, founder of the Bauhaus, the architect who streamlined design early in his career and who saw the school as a place for designers to collaborate in an ideal setting . . . a dashing hussar, the ardent young lover of the renowned femme fatale Alma Mahler, beginning when she was the wife of composer Gustav Mahler . . . Paul Klee, the onlooker, smoking his pipe, observing Bauhaus dances as well as his colleagues lectures from the back of the room . . . the cook who invented recipes and threw together his limited ingredients with the same spontaneity, sense of proportion, and fascination that underscored his paintings . . . Wassily Kandinsky, the Russian-born pioneer of abstract painting, guarding a secret tragedy one could never have guessed from his lively paintings, in which he used bold colors not just for their visual vibrancy, but for their sound effects . . . Josef Albers, who entered the Bauhaus as a student in 1920 and was one of the seven remaining faculty members when the school was closed by the Gestapo in 1933 . . .Annelise Else Frieda Fleischmann, a Berlin heiress, an intrepid young woman, who later, as Anni Albers, made art the focal point of her existence . . . Ludwig Mies van der Rohe, imperious, decisive, often harsh, an architect who became director the last of the Bauhaus, and the person who guided the school s final days after SS storm troopers raided the premises. Weber captures the life, spirit, and flair with which these geniuses lived, as well as their consuming goal of making art and architecture. A portrait infused with their fulsome embrace of life, their gift for laughter, and the powerful force of their individual artistic personalities." Nicholas Fox Weber was born in Connecticut and graduated from Columbia College and Yale University. He is the author of fourteen previous books, among them "Le Corbusier, The Clarks of Cooperstown, Balthus, Patron Saints, Leland Bell, "and "The Art of Babar." He and his wife, the novelist Katharine Weber, live in Bethany, Connecticut, and Paris.